Cleveland market TV viewers are no stranger to Ben Matlock in rerun form, or the propensity of local stations to run “Matlock” in prime time occasionally. But this time, Gannett NBC affiliate WKYC/3’s decision to bump NBC’s Thursday night lineup out of prime time for a 2-hour 1992 TV movie featuring the genial southern lawyer played by Andy Griffith…well, went viral. Almost as soon as ol’ Ben started TV lawyering, our own social media presence was swamped. The clamor went nationwide, and even big time media watchers like the website of “Entertainment Weekly” picked up the baton, telling the nation that our local NBC affiliate preempted (actually moved to late night): a repeat of “The Office”, a new episode of “1600 Penn” (a White House-set sitcom), and a repeat of “Law and Order: SVU”. The Matlock Move also made The Hollywood Reporter and Huffington Post websites. The metered-market ratings show Matlock actually outperformed 1600 Penn‘s recent delivery in the Cleveland market, and was about on par with The Office repeat’s national performance. During the 10 p.m. hour, however, the SVU repeat was clearly more popular. ShowBuzz Daily has actual numbers, and Ben Matlock and his crew in Georgia courtrooms airing on WKYC actually edged out “1600 Penn”‘s average on 55 other NBC affiliates. Simply put, the WKYC head honcho tells “EW” that they had the movie, and that the Oscars flap was a good reason to run it as one of the times the station runs local movies. 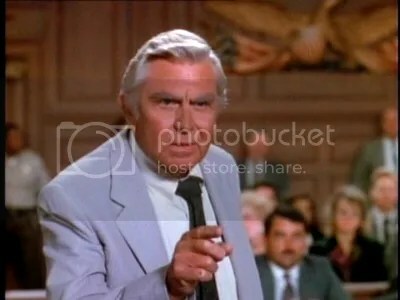 The math is simple: with even comparable ratings to the NBC prime time preempted shows, WKYC has all the local ad avails in the two-hour “Matlock” movie, and makes all the money. But a rather simple local TV story caught fire nationwide for one reason: in the most recent national “sweeps” ratings last month, NBC actually finished FIFTH…behind the Univision Spanish-language network. “Deadline:Hollywood” reports that Univision touted its success in an English-language ad… and of course, with its fourth-place finish among all networks, the owner of Cleveland’s WQHS/61 also beat…yes, Telemundo, a Spanish-language network owned by NBC Universal. Though NBC actually won last November’s sweeps, the current performance reminds one of the Peacock Network’s ill-fated move of Jay Leno to prime-time. As noted, Ben Matlock is no stranger to a prime-time role on Cleveland TV…as Scripps ABC affiliate WEWS/5 has turned to “Matlock” reruns to make more local cash in the past. in a possibly related move, director of programming and sales marketing Terry Moir told The A.V. Club that WKYC no longer plans to air Matlock: The Heist. (“Matlock”) even tied Kimmel in the overall demographic of people 18 -34 years old, which is remarkable considering a good portion of that audience hadn’t been born or was still in diapers when the show premiered. Who the hell cares? I haven’t watched “PRIME TIME” TV crap for 20 years….oh, once and I while I will dredge by the networks at 8pm to see what they have to offer. Pure CRAP. Dancing, pro-progressive agenda @h!t…nothing worth watching. I feel sorry for the current generation…they don’t get to watch “Mission Impossible” or “Barnaby Jones” or any other show that has a message that VIRTUE prevails…only debauchery. My son watches History or Discovery….not what the big 4 networks PUKE out night after night. WKYC really loves to air the Matlock reruns. I didn’t think anything of it – except that there was nothing else to watch. So, I read a book and went to bed early. Thanks channel 3!